indicates the ground surface level outside the building is marked "Grade" or "Grade Line." The elevation of a surface at a particular point is a grade elevation. A grade elevation may refer to an existing, natural earth surface or to a hub or stake used as a reference point, in which case the elevation is that of existing grade or existing ground. It may also refer to a proposed surface to be created artificially, in which case the elevation is that of prescribed grade, plan grade, or finished grade. Grade elevations of the surface area around a structure are indicated on the plot plan. Because a natural earth surface is usually irregular in contour, existing grade elevations on such a surface are indicated by contour lines on the plot plan; that is, by lines that indicate points of equal elevation on the ground. Contour lines that indicate existing grade are usually made dotted; however, existing contour lines on maps are sometimes represented by solid lines. If the prescribed surface to be created artificially will be other than a horizontal-plane surface, prescribed grade elevations will be indicated on the plot plan by solid contour lines. On a level, horizontal-plane surface, the elevation is the same at all points. Grade elevation of a surface of this kind cannot be indicated by contour lines because each contour line indicates an elevation different from that of each other contour line. Therefore, a prescribed level surface area, to be artificially created, is indicated on the plot plan by outlining the area and inscribing inside the outline the prescribed elevation, such as "First floor elevation 127.50 feet." LEARNING OBJECTIVE: Upon completing this section, you should be able to determine boundaries of building layout. Before foundation and footing excavation for a building can begin, the building lines must be laid out to determine the boundaries of the excavations. Points shown on the plot plan, such as building corners, are located at the site from a system of horizontal control points established by the battalion engineering aids. This system consists of a framework of stakes, driven pipes, or other markers located at points of known horizontal location. A point in the structure, such as a building corner, is located on the ground by reference to one or more nearby horizontal control points. We cannot describe here all the methods of locating a point with reference to a horizontal control point of a known horizontal location. We will take, as an illustrative example, the situation shown in figure 5-16. This figure shows two horizontal control points, consisting of monuments A and B. The term "monument," incidentally, doesn't necessarily mean an elaborate stone or concrete structure. In structural horizontal control, it simply means any permanently located object, either artificial (such as a driven length of pipe) or natural (such as a tree) of known horizontal location. In figure 5-16, the straight line from A to B is a control base line from which the building corners of the structure can be located. Corner E, for example, can be located by first measuring 15 feet along the base line from A to locate point C; then measuring off 35 feet on CE, laid off at 90 to (that is, perpendicular to) AB. 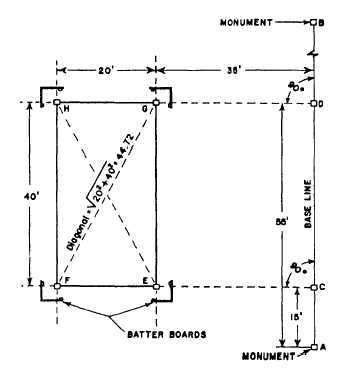 By extending CE another 20 feet, you can locate building corner F. Corners G and H can be similarly located along a perpendicular run from point D, which is itself located by measuring 55 feet along the base line from A. Figure 5-16. - Locating building corners.